Brazil had elections to choose its next president, and Dilma Rousseff won. She will be Brazil’s first woman president and will take office on January 1. Brazil’s current president, Lula da Silva, has been the leader of the country for two terms since 2003. According to Brazil’s law, President Lula could not run for a third term. President Lula is adored by the Brazilians, and has a “rags to riches” story. Born in a family that struggled financially, he hardly went to school, and learned to read only when he was 10. As a child, he worked as a shoe-shine boy, a street vendor, and a factory worker. He even lost one of his fingers in a factory accident. Lula became a union leader, and eventually became the number one leader of Brazil. 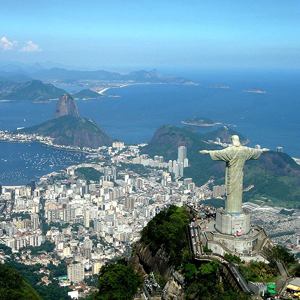 Brazil is the fifth largest country in the world (by both area and population). It was a Portuguese colony for over 300 years, and got its independence in 1822. Most Brazilians are descendants of the Native American people, the Portuguese people, the slaves from Africa that the Portuguese brought, or a mix of them. There are terms that describe what type of ancestors a person has. For example, “mulatto” means mixed white European and black African, “caboclo” means mixed white European and Native American, and “cafuzo” means mixed black African and Native American. There are many famous things that are associated with Brazil – the Amazon Rainforest (the largest rainforest on our planet), the Amazon River (the second longest river in the world), the Christ the Redeemer statue (a tall statue of Jesus Christ overlooking the Brazilian city of Rio de Janeiro), the Copacabana beach (famous for its New Year Eve’s parties), the Rio Carnival (an annual street party), and the samba (a Brazilian dance). Brazil’s capital is Brasília, and its official language is Portuguese.